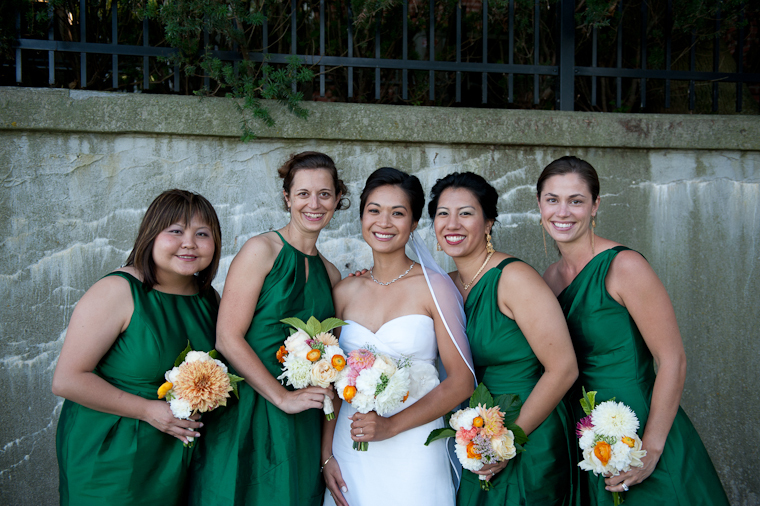 Emerald green and bright orange hues pop in today's real wedding photos from Joan & Jared, married last August in Illinois at the Unitarian Church of Evanston. When we asked Joan about her favorite part of wedding planning, she recalled the family contributions that made her day special. 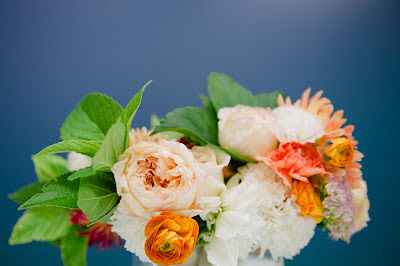 "Our favorite part was finding ways for family and friends to add their personal touches to the wedding, like my dad growing dahlias to add to the bouquets and centerpieces and Jared's mom hand drawing and painting table letter illustrations for the dinner tables. We wanted the whole day to feel very personal and meaningful and it did". 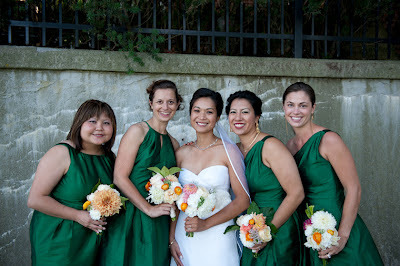 The bridesmaids wore Alfred Sung styles D440, D441 and D462 in Pine Green dupioni fabric. Jewel tones are flattering on every skin tone! 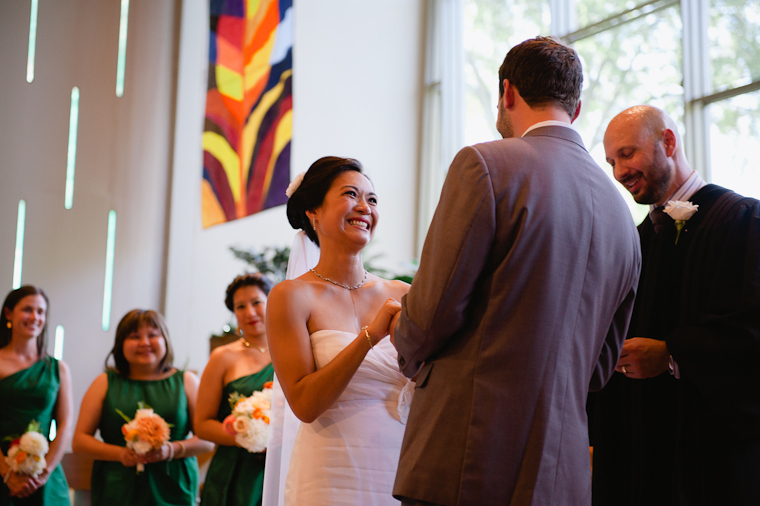 All weddings have some small hiccups that make the day more memorable. "Just as my parents and I were about to enter the church sanctuary and walk down the aisle, my dad's cell phone went off, and he answered it! Apparently an uncle of mine had gotten lost going to the church. I almost couldn't stop laughing. It was the perfect bit of levity at the exact right moment. (And my uncle did eventually find his way to the church.)" 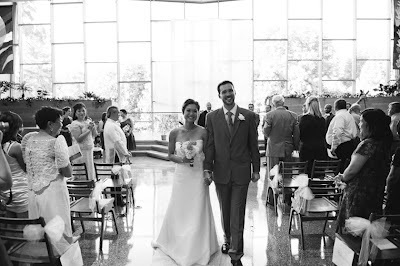 Joan's favorite moment was right after the ceremony when she and Jared exited and had a brief moment alone. We held each other for a minute or two just feeling a sense of relief, accomplishment, and ease. We had put a lot of work into planning our wedding, and it felt so great to be married!" 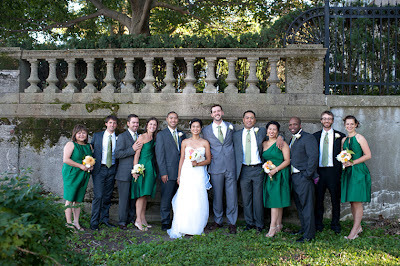 Congrats Joan and Jared! We hope that you are kicking back and enjoying a blissful marriage together.